Cambridge, MA—Bismarck, North Dakota might not be as famous as Fargo—with its namesake movie-turned-TV series—but as the state capital and home to Bobcat Company’s Acceleration Center, it’s got its own claims to fame. The Acceleration Center is a flagship research, design and engineering facility. Opened just over a year ago, the 190,000-sq. ft. complex is a magnet for young engineering talent and cutting edge technology. And that’s exactly why Bobcat contracted Eckel Noise Control Technologies to design and install a state-of-the-art test chamber there. The Eckel SuperSoft Test Chamber provides a customized solution for evaluating noise and vibration emitted by Bobcat® machines and components. It features high-performance perforated metal sound-absorbing panels, which are installed using a track and batten system. The V-ridged panel facings help to maximize noise reduction. 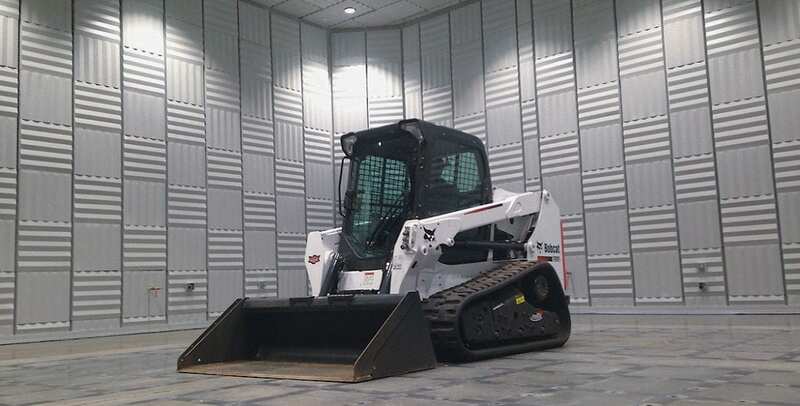 Designed to match or exceed the sound absorption characteristics of an existing chamber at Bobcat’s Gwinner, ND facility, the Eckel chamber blocks the transmission of noise from testing in other parts of the Acceleration Center to provide a totally insulated and quiet environment. The chamber is big enough to hold some of Bobcat’s larger equipment, such as skid steer loaders, compact track loaders and compact excavators. The room’s ventilation and exhaust systems allow for operating the machines under full load, while the floor grid supports the bolting down of fixtures for component tests on engines, hydraulic systems and cooling systems. Installed hydronic lines provide external cooling. Internally, the chamber measures 50 ft. long by 51 ft. wide and 25 ft. high. It features a 12-ft. by 14-ft. vehicle door; a 90-in. by 41-in. personnel door; and a 48-in. by 42-in. viewing window of laminated safety plate glass. The walls, ceiling and doors are covered with Eckel’s SuperSoft perforated metal panels, each measuring 30 in. by 30 in. The chamber has a 200-Hertz cutoff frequency (meaning it is 99% sound energy-absorptive at frequencies of 200 Hertz or higher). It meets the ISO 3745 standard for transmissibility and has a base ambient sound level of 22 dBA, exceeding Bobcat’s target of 30 dBA. Construction and installation began on September 24, 2014 and finished on December 1, 2014. Bobcat started setup for its first test in the chamber that very afternoon. The test involved a spherical beamforming project in collaboration with Sound Answers and Brüel & Kjær. Spherical beamforming creates a 360-degree sound field map in confined environments like vehicle cabins and measures sound pressure, sound intensity, particle velocity and sound quality. With expertise in creating optimal sound environments, Eckel Noise Control Technologies has been at the forefront of acoustic analysis and design for more than 60 years. Headquartered in Cambridge, MA, Eckel helped to create the world’s first Anechoic Chamber at Harvard University. Since then, the company has pioneered chamber design for use in product testing—from cell phones to cars to jet engines—helping engineers and manufacturers achieve exceptional quality standards. Building on the science behind its chambers, Eckel’s Audiometric Rooms create the ideal controlled environment for hearing testing and other sound isolation applications; while its Acoustic Panel Systems provide precise control of reverberation and background noise in any setting—from auditoriums and gyms to concert halls and industrial facilities. No matter the acoustic challenge, Eckel has a sound solution. Learn more at www.eckelusa.com.